Setting A New Standard! If you are looking for a rugged, reliable and capable welder for demanding construction, rental fleet or repair applications, take a close look at the Vantage 500. Standardstainless steel roof and side panels, simple controls and Chopper Technology™deliver the low maintenance, long service life, easy operation and great arc performance every owner appreciates. This multi-process powerhouse features 500 amps at 100% duty cycle, or 575 amps at 50%. 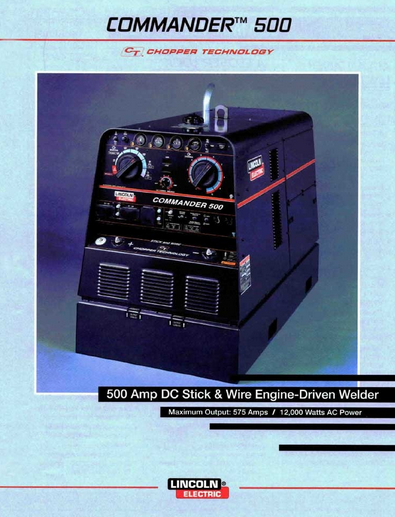 Don’t pay extra for plenty of AC auxiliary power – 12,000 watts while welding up to 250 amps is standard. Select the 48 horsepower oil/air-cooled Deutz engine or the 56 horsepower water-cooled Cummins engine. Either way, you can depend on legendary engine reliability from well-known brands and superior Lincoln arc performance.